The Izu Peninsula is in eastern Shizuoka Prefecture, about 100 kilometers from Tokyo, jutting out into the sea from the southern foothills of Mt. Fuji. Izu is predominantly mountainous, and at its center flows the Kano River. Following the Kano River upstream, you will come to a beautiful gorge at the foot of Mt. Amagi. This is where you will find the Yugashima hot springs. Many writers have fallen in love with Yugashima. 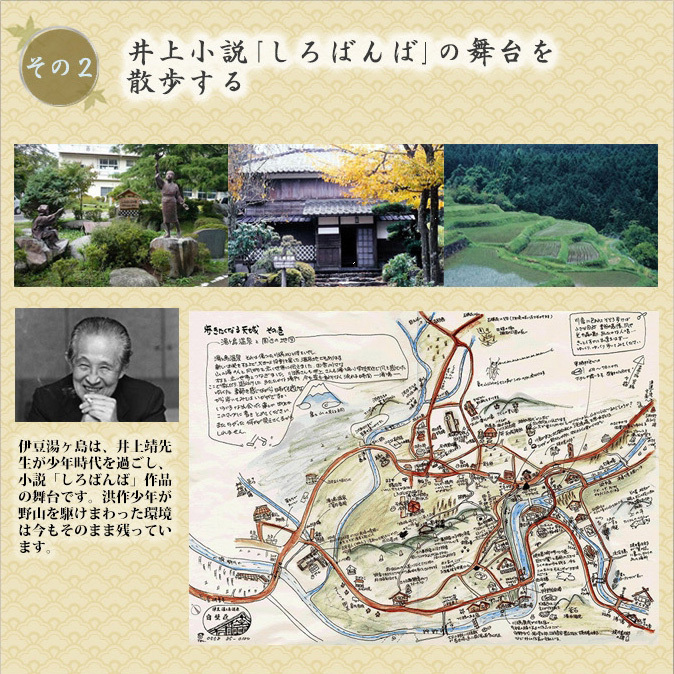 One writer whose love for the hot springs grew the longer he stayed here was Yasunari Kawabata. In 1968, Kawabata achieved worldwide fame when he became the first Japanese person to receive the Nobel Prize for Literature. His best-known work ﾒThe Dancing Girl of Izuﾓ is set in Yugashima. In his work, he refers to Izu as the archetypal Japan. 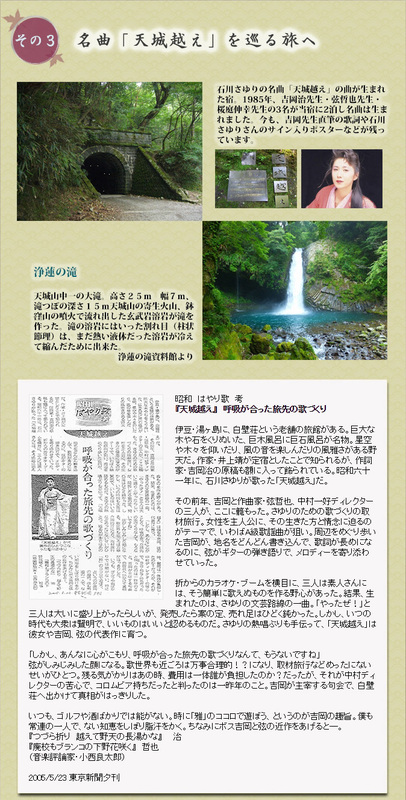 In other words, Japan's history and culture is concentrated in Izu. Izu has a cultural history that stretches back over 1,200 years. From around the eighth century, it had already established flourishing ties with the major cultural centers of Japan at the time, such as Kyoto and Ise. This was the age that saw the construction of the Horyuji and Todaiji temples and the compilation of the oldest anthology of Japanese poetry, the Manyoshu in the capital. This was the age that saw the creation of the elegant culture and the beautiful simplicity of the buildings of Nara and Kyoto. According to two works written during this period, the Kojiki and the Nihonshoki, ships were built at Yugashima at the decree of the Yamato Court, which ruled over Japan, to be presented as gifts. Moreover, Izu was a refuge for nobles defeated in the power struggles in the capital. These nobles brought the elegant culture of the capital to Izu. The 12th century saw a shift from a political system in which the emperor reigned supreme to a political system in which warrior clans, having wrested power from the emperor, ruled in his place. The man who founded this system was Minamoto no Yoritomo. After suffering defeat in the political struggles in Kyoto, he moved to Izu, where he spent his youth. After that, he seized power from the opposing forces of the Heike clan. With Izu as his base, Yoritomo controlled the whole of Japan. This was the beginning of around 700 years of warrior rule. Around the middle of the 19th century, four American battleships arrived in Uraga, Kanagawa Prefecture. Commodore Matthew Perry, bearing an official letter from the U.S. government, demanded that Japan open diplomatic relations. The Tokugawa Shogunate signed the Japanese-U.S. Treaty of Peace and Amity, and opened up the ports of Shimoda in Izu and Hakodate in Hokkaido. In this period, Izu became the scene of diplomatic negotiations with foreign powers, and it saw the coming and going of many Japanese and foreign officials. Izu became the stage on which history unfolded. Izu also boasts a rich natural environment that has remain untouched from long ago. This is because Izu has been nationally owned land for more than 700 years. As a result, the natural environment in Izu was spared deforestation and recent urbanization, staying as it was in ages past. The Izu Peninsula has now been designated as part of the Fuji-Hakone-Izu National Park. It is blessed with plentiful forests and clear water, and these are recognized and protected as a natural beauty that Japan can show with pride to the rest of world. Izu has some of the finest hot springs in Japan, attracting many visitors who enjoy soaking in the hot springs that gush everywhere out of the earth, and the traditional culture preserved here. 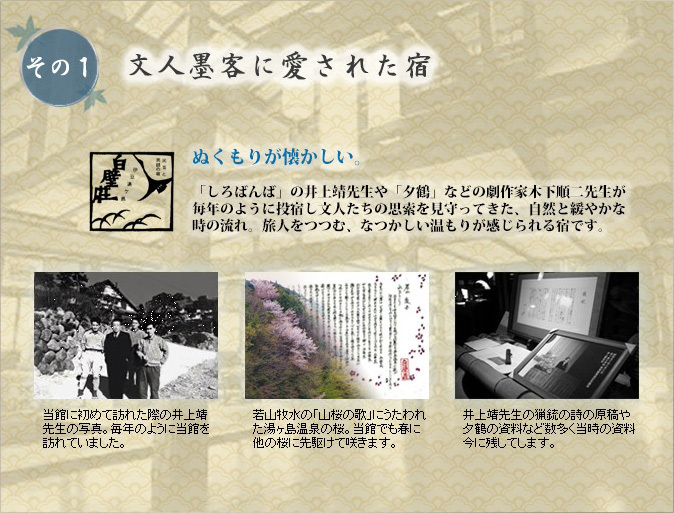 Nobel laureate Yasunari Kawabata came here for the first time when he was 20 years old. The Yugashima that he encountered then was a place where one could immerse oneself in untouched, carefully protected natural surroundings and which still bored the shadow of historical events and a culture that sprang from ties with the old capital. Kawabata saw it as an archetypal form of Japan, and not only Kawabata, but many other artists, have produced works about Izu. To travel through Izu is nothing less than to travel through an archetypal Japanese landscape. To visit Yugashima, where archetypal forms of Japan's traditional culture, history and nature still exist as they did long ago is to personally experience a beauty that is different to other Japanese landscapes. By coming into contact with this landscape, your trip to Japan will provide you with some of the most profound memories of your life. The inn loved by writers and artists: I'm homesick for warmth. "SHIROBAN, when" the nature by which Mr. Yasushi Inoue and Mr. playwright Junji Kinoshita of "crane at dusk" etc. have checked in like every year and have watched the thought of the literati and the flow when being gentle. The dear warmth in which a traveler is wrapped is a felt inn. This palace was visited like Mr. Yasushi Inoue's picture (the left) every year when visiting for the first time in this palace. Cherry tree in the Yugashima hot spring sung by Bokusui Wakayama's "song of" a wild cherry tree (the inside). Even this palace blooms prior to other cherry trees in spring. A manuscript of poetry and material of a crane at dusk of Mr. Yasushi Inoue's shotgun (the right) often leave material in those days soon. I stroll through a stage of Yasushi Inoue's novel "SHIROBANBA". "SHIROBANBA" for, Yasushi Inoue's autobiography-like novel. Of the title, "SHIROBANBA", snow bug. An author was a stage of this work and could see the view about which this bug will fly in dusk in autumn at a mountain village and Yugashima in Izu-hanto central part in Shizuoka-ken where one spent the infancy lifetime. I stroll through a stage in Inoue novel SHIROBANBA: Mr. Yasushi Inoue spends his lifetime and Izu Yugashima is a stage of a novel "SHIROBAN, when" work. The environment that a kousaku boy ran about in hills and fields is also left just as it is now. To travel concerning a famous tune "Amagi Goe". To travel concerning a famous tune "across Amagi": The inn where a song of Sayuri Ishikawa's famous tune "across Amagi" was born. 3 people, Mr. Osamu Yoshioka, Mr. handle Tetsuya and Mr. Nobuyuki Sakuraniwa stayed at our inn for 2 nights in 1985, and a famous tune was born. A text of Yoshioka teacher autograph and a poster with Mr. Sayuri Ishikawa's signature are also left now. It was also played when Ichiro (who is a major league player) went up to bat in a season in 2008. This goes back to off season, and Ichiro who was seeing White and Red Song Contest is Sayuri Ishikawa, I sing, "across Amagi" is heard, and says that it's because I thought "a record, beyond various ones, red snapper". Ishikawa was invited to a home game of Mariners after that. But, if it's "baseball tone-deaf person", one says Ishikawa. It's satisfied with performance of a firefly. It's satisfied with performance of a firefly: A firefly in Amagi-yugashima is Hajime Izu. That, nature, because it's abundant, it's because it's possible to see "natural indigenous firefly". 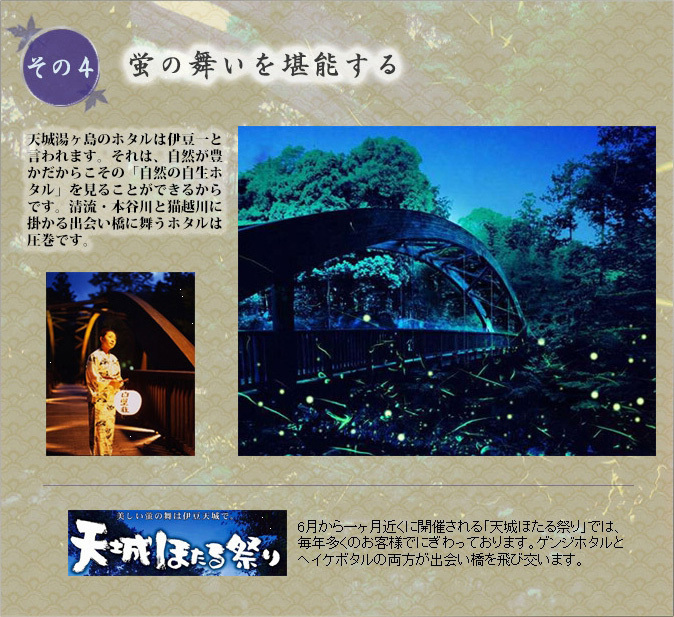 The fireflies which are danced in a clear stream, Hontani river and the encounter bridge it takes for cat Etsukawa are highlights. Top grade Japanese horseradish is enjoyed. 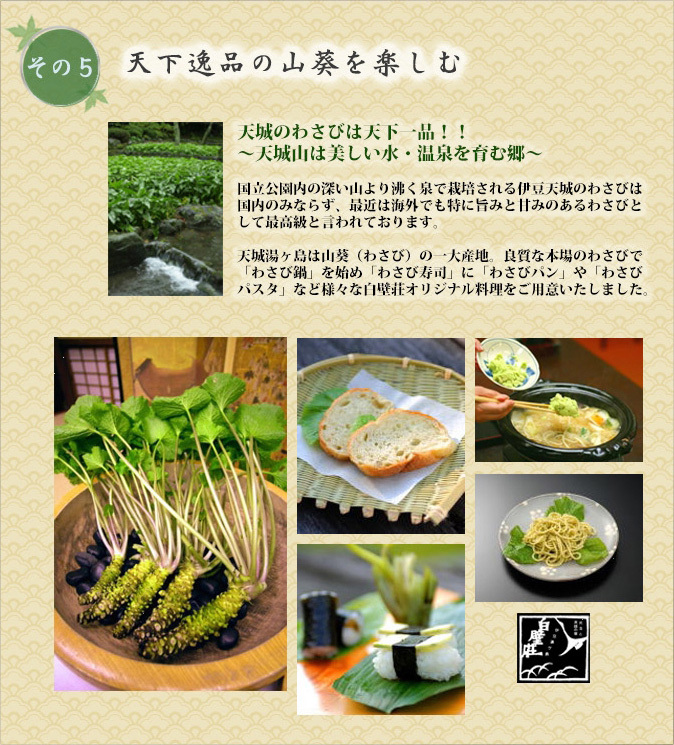 Japanese horseradish of the world gem is enjoyed: The Japanese horseradish from Amagi is top grade! -You're saying Amagi-san is beautiful water and the spring where I boil more than a deep mountain in the village where a hot spring is brought up-national park, and that the these days as well as the country are also first-class as the flavor and the Japanese horseradish which tastes sweet in particular at foreign countries for Japanese horseradish from grown Izu Amagi. The grave producing center where Amagi-yugashima is Japanese horseradish (Japanese horseradish). "Japanese horseradish bread" and "Japanese horseradish pasta" began "Japanese horseradish pot" with good central Japanese horseradish, and prepared a various white wall cottage original dish for "Japanese horseradish sushi".